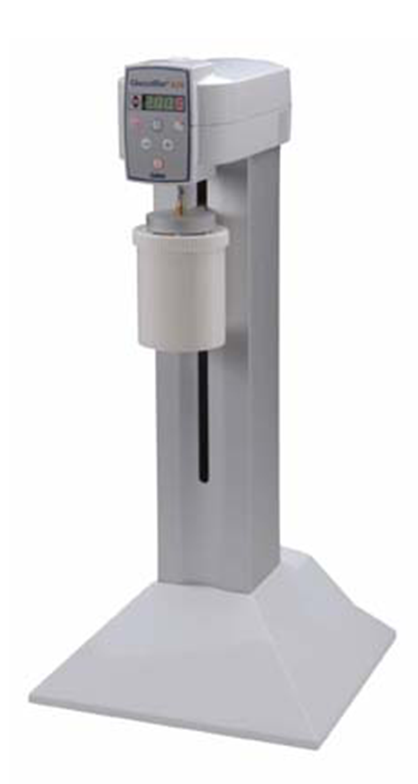 The Unguator e/s model features increased speed and volume ranges, programmable mixing parameters, and automatic jar oscillation for jar sizes 15-500 ml. The Unguator e/s allows the operator to program mixing requirements (time and mixing speed) into a display and operate the machine “hands free”, which also increases product quality of the finished preparation. The unit has two modes of operation: HAND – the oscillation arm moves to its lower position, allowing the operator to manually control jar movement, and AUTO – the mixing Jar is screwed into the oscillation arm and the machine controls the oscillation by itself. After the mixing process is finished, the machine automatically introduces a free-spin mode (FSL) for cleaning the standard mixing blade from excess material. The engine of the Unguator e/s requires a cooling period after each preparation.